Beauty Blender Sponge: I have been loving this for the past month! It's great for pressing powder over the skin which really helps to set the makeup. I feel like you can get more coverage using powder with the Beauty Blender than with a brush. I also love the shape of this because you can use the tip to put powder under your eyes and around your nose where oil tends to collect. I have been using it daily! Tarte Amazonian Clay 12-Hour Blush in Dollface: Not only does this last all day, but it's the perfect everyday pink. It's easy to wear and is totally matte so it creates a natural flush without looking artificial. 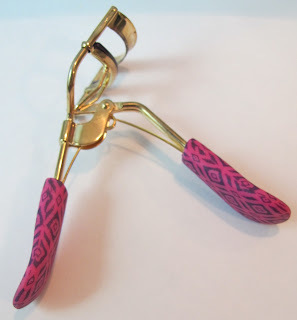 Tarte Eyelash Curlers: I had always used an eyelash curler from the drugstore and thought it served the purpose well enough. I was watching Lisa Eldridge on Youtube and she said that the higher end eyelash curlers really work a lot better. So, I saw this eyelash curler from Tarte with the cute design and I decided to give it a try. It has quickly replaced my Covergirl one because it is basically just more comfortable and easy to use and does an amazing job curling. Definitely worth the upgrade! MAC lipstick in Dark Side: If you follow me on Instagram (Mlormies) you know I have been wearing this lipstick a ton this month. There is something about this color that I can't get enough of! There was no question about this being on the November favorites list! MAC nail polish in Formidable: This color is so pretty and unique, it became a quick favorite! Village Candle in Winter Wonderland: I got one of these Village Candles in a different scent (Christmas Tree) and was happily surprised by how fragrant it was. Also, when the wick burns it makes a pleasant little crackling sound. I got these at the grocery store on sale for just a couple bucks so I wasn't expecting such a high quality candle! I love candles all year round, but especially around the holidays and these create such a cozy atmosphere! Those are my favorites for November, let me know one of your faves this past month! !